He was counting up to 20 by age two and now sounds out the first letter of words. He can count up to 40 without help and backwards from 12. He is VERY interested in words and has also taken an interest in learning to subtract. Sometimes this is flattering, but mostly I brush away the compliment and put it back on Eddie. He has a natural curiosity and flair for learning. It has nothing to do with my being a teacher. I mean, I was naturally bright and my parents weren’t teachers. I will admit, however, that because I am a teacher, there are strategies I use with him when we read that I know will help him be a more critical thinker and better reader as he gets older. I thought I would share those with you today. I know we have all heard it before, but it is NEVER too early to introduce your children to books. I used to read to both Eddie and Charlie before they were even born. Plus because they both had the extra bonus of having an English teacher as their womb, they both heard some fascinating American Literature while they baked away in there. The nursery is also filled with books. Our living room has my bookshelves, but it also has lower shelves filled with kids books. Eddie’s room has shelves of books. Literally every room that you can relax in in our house has books in it that are accessible to the kids. I have a wall in my classroom that says “Good Readers…” and at the top of the list is ASKS QUESTIONS. Even before my boys could talk, I would ask them questions about the books they bring me. With Charlie, he will have a board book and I will ask “What is this book about? Do you see the duck? What does a duck say? Quack Quack?” He can’t answer my questions yet, but hearing them asked helps him associate books with inquiry. It’s also a good opportunity to model language. I don’t usually read a whole book with him, but I let him flip the pages and I will ask questions and point to things as we “read”. Eddie and I do a lot of “hey, you have a bike like that!” and “that is just like in this book/show/movie/etc!” and “what happens when you are not kind?” Making connections between pieces of literature, other media, and their own life is a critical thinking skill that will help with problem solving later on. When kids can naturally connect new things they learn with previous knowledge, they will be able to understand new concepts quicker. This may seem obvious too, but reading should be seen as a fun thing. We never force books on either of the boys. They are available, and have become part of our daily routine. Every night Eddie gets to choose either a “real” book, or a book on either my Nook or Cort’s tablet. If he didn’t want to read, we wouldn’t make him, but he has never said he didn’t want to read. In that same strain, we don’t make him finish a book if he doesn’t want to. Some nights we start a book and he says, “I don’t really want to read this one.” So we quit. Finishing a book shouldn’t be a chore. At Charlie’s age, if he brings me a book we look at it until he doesn’t want to. I don’t force him to sit and listen to me read the whole book. He’s too young for that kind of focus. I’ll read the words until he flips the page or flings the book down and moves on to something else. My hope is that my children will love to read as much as I do, but I know that might not be the case. But even if they are not devouring novels by the pile, I want them to be good readers. I want them to have critical thinking skills. I want them to be able to problem solve. 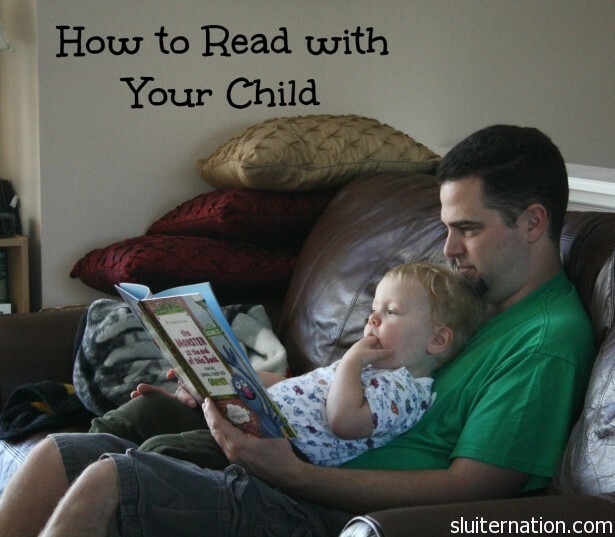 What kinds of things do you do when you read with your kids? What are their favorite books? Suggestion one – I couldn’t agree more. I lost my job when he was 4 months old, so we spent a LOT of time together over the last few years. He had mats with letters on them, so in addition to lots of story time, we also “played” with letters a lot. How they sound, how to make words with them. He’s reading now. Among his favorite books: Any of Mo Willems’ Pigeon books, SkippyJon Jones, The Giant Jam Sandwich, and The Mixed-Up Chameleon. Great post and so true. I also used to be a teacher once upon a time, so maybe that is why I employ the same strategies. My oldest was allergic to milk for the first year of his life so we had to formulaic feed him, with by the cost of it, I’m pretty sure was liquid gold. Anyway some of my fondest moments were feeding him a bottle and reading to him. He would rub my arm with one hand an point at the page or try and flip it with the other. I miss those days! We’ve always read to our girls. Our oldest has always loved books, but the twins could never sit still. It made it so difficult to read to all of them, but now they all love books. My oldest started kindergarten in September & quickly became the best reader in the class. I’m sure her ability to read was already there, but she was too stubborn to actually believe her parents about sounds letters make. The Giant Jam Sandwich is an awesome book. I loved it as a kid & now my girls do too. Oh the Places You’ll Go is my oldest’s favorite. I do all of this. Also a teacher. I sometimes forget, especially when I get my new group of kiddos every year, that sometimes they never get read to. And man that hurts my heart. We also have a gazillion books. I also promote Imagination Library to anyone who has that in their area because you can get a free book every month for your child until they are 5! I like to also use puppets, felt pieces and make connections. Like with our twinkle twinkle little star book. I read it, sang the song (with motions) and then we decorated stars. If you give a moose a muffin, we made muffins and ate them. etc… making connections is the biggest. And books on things they are interested on! And never ever make reading/writing a punishment. Agh. Former pre-k teacher here and I agree with all of those! I’d also add talking about the parts of the book (front cover, back cover, spine, title page, dedication page etc). Talk about the difference between an author and an illustrator. Point to words-talk about reading from left to right etc. Love all these tips. I definitely want my kid to love reading like I do. We’ve spent years building up a pretty substantial book collection (mostly from thrift shops, books for <$1 ftw!) and I can't wait to read with my little guy. It does stink that people credit this to you being a teacher. Every child’s life should be filled with books and talking with parents and counting things. This shouldn’t be a teacher’s kid thing; it should be an every kid thing. Teacher’s kid or not, books should be in every child’s life!! Great tips, Katie. I adore Lucas’ love of books and reading with him is one of my favorite activities.